Often seen as a more hardwearing alternative to traditional steel lockers, the Supertuff plastic lockers provide an exceedingly versatile and robust storage solution. Without the risk of corroding, rusting or denting over time, our plastic lockers can be used in almost any demanding environment whether it be the factory floor or outside in the school yard. Manufactured in our UK factory using a rotational moulding process, we have a broad range of sizes, colours and locking options available to choose from, allowing you to create a bespoke storage area that meets your requirements. As the material itself is weather proof, plastic lockers can be used outside, typically under shelters or with other changing room equipment, where the material will stand up to the changing temperatures and damp conditions. Water resistant material – The lockers are molded from water resistant plastic, which means that the material will never rust or corrode, this allows the lockers to be used with confidence in wet/damp areas. Strength and durability - The polyethylene plastic material has excellent impact resistance enabling the plastic school lockers to easily withstand the general wear and tear they endure as part of everyday life. The doors are molded with a double thickness of material to give added strength. This avoids the common problem of locker doors denting and bowing out of shape, the Supertuff plastic lockers will not dent making them ideal for plastic school lockers. Hygienic design – The smooth molded construction of the lockers makes them easy to clean and prevents the build-up of dirt, great for gym lockers. Noise reduction – Plastic lockers are quieter to operate than steel lockers, reducing the noise levels in busy locker rooms such as gyms and schools. Where to use our Lockers? The plastic locker can be used anywhere and are especially popular for applications where the benefits listed above make them the ideal choice. They are very popular in schools, colleges and universities for use as student lockers and as staff lockers, where the contemporary appearance, choice of colours and durability make them an attractive option. The fact that the lockers can be used outside has led to many facilities opting to set up banks of lockers under shelters in outdoor areas. This provides plenty of storage for staff or students whilst saving valuable internal space. This is especially popular in schools where storage space can is at a premium. The hygiene properties enable the plastic lockers to be used with confidence is hospitals and high care manufacturing sites such as food, pharmaceutical and packaging factories. The plastic lockers are available in a range of different colours and a choice of three heights, small 450mm, medium 600mm and large 900mm. The length and width of each size are the same, allowing the lockers to stack in different combinations. 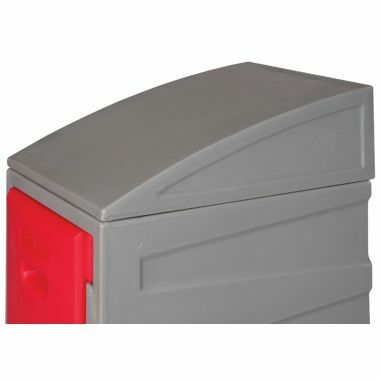 The lockers can be supplied with or without sloping tops to prevent the build-up of litter and stands are also available to raise the lockers off the ground. As standard we supply lockers with either a key operated cam lock or a swivel catch lock that is locked using a padlock. Coin operated lockers are also available. Supplied as individual compartments, Supertuff plastic lockers are easy to install. Simply drill through the pre-marked fixing points, stack the lockers together and use the plastic fixings to secure them in place. We are all familiar with lockers, from school days to working environments, even at the gym and many public places where your items need to be stored safely whilst you go about your business, free from the burden of being overloaded by personal items. Lockers from G-Force are particularly durable, an essential quality for an item which needs to be built to last through the wear and tear of everyday use. Having previously been made with metal, plastic is now the most popular material, because it is not only just as durable when made in the correct way, but is unlikely to rust or corrode. This means that the lockers can be placed in any conditions, even outdoors, and will not be affected, making them ideal for all environments. 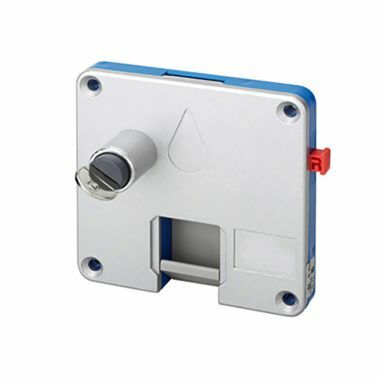 They are also easy to clean, meaning that they can be placed in any environment without the hassle of having to worry about the hygiene of the lockers. The lockers we manufacture and sell can endure any environment, even those which are considered the harshest, such as schools, gym changing rooms or even outside conditions. The plastic lockers manufactured at G-Force are made from linear low-density polyethylene (LLPE), which is a particularly strong type of plastic, impact resistant which is great for the everyday use lockers are sure to be put through. The doors are made with double thickness, meaning they are unlikely to get dented or going out of shape, which can cause trouble when locking, and is a common problem for most lockers. The lockers we provide are ideal for schools or gyms where they are likely to endure the most wear and tear and very regular usage. The use of plastic lockers as opposed to another material such as steel also minimises noise levels when frequently being opened and closed, which is particularly important in a school environment or workplace, where noises can be distracting and disruptive. G-Force offer three different sizes of lockers, so we are sure to offer exactly what you require. They come in three different sizes: small which measures to be 450mm; medium measuring up at 600mm; and large which measures to be 900mm. The length and width of the lockers all measure so that they can be stacked on top of each other in different combinations. This is ideal for space saving. Smaller lockers are ideal for standard school lockers in which students can store their books, sports kits and additional paraphernalia they bring to school. Medium and larger sized lockers are often used in sports environments such as gyms and swimming pools, or even in a working environment such as a staff room in which employees need a place to store their belongings whilst doing their work. It is easy to mix and match locker sizes so that you can save space with the smaller sized lockers, whilst also allowing for those who need a larger space to store their items. The plastic lockers we supply at G-Force are aesthetically pleasing; they come in different colours, ideal for any school, college or working environment to ensure a vibrant looking workplace. This means that they can be chosen according to the other colours of the environment to match. The colours can also be useful for organising the workplace into colour coded sections. This way you can assign coloured lockers to individuals. They are easy to maintain hygienically because the material allows them to be wiped clean and they are extremely robust, meaning that they will look pristine for a very long time with no dents or misshapen plastic as you might expect for school or gym lockers. 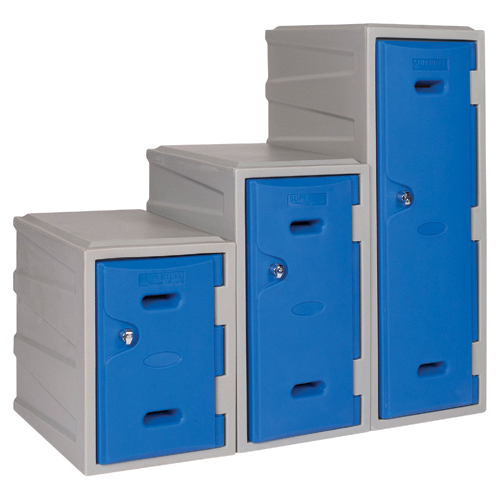 G-Force supply lockers with standard flat tops, or with sloped tops. Sloped tops are particularly useful for preventing a build-up of dirt and littering being piled on top, maintaining the cleanliness of the environment for a professional and immaculate appearance all round in your environment. 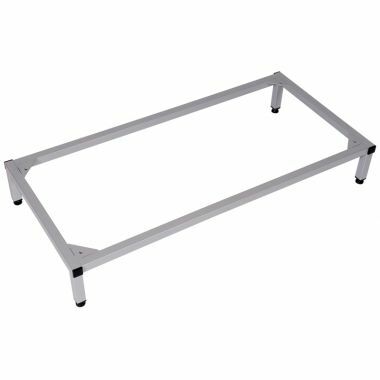 Stands can also be purchased in order to raise the lockers off the ground, avoiding supplying your clients or workforce with those bottom row lockers everyone attempts to avoid, and ensuring all lockers can be used by anyone with ease. Putting lockers on stands also ensure a more hygienic approach, and allows for drainage should need be. They can easily be placed outside or on an uneven terrain. The lockers and stands have built-in fixing points so there is no need to worry about how they will be structured, as this is all organised for you. The legs are adjustable so you can choose the height you would like the lockers to be set at, and you can also ensure that lockers are upright, even when the terrain is not even. The stands are manufactured using only the strongest British steel, which is just as durable as the lockers themselves. They come in a range of different sizes so you can choose the size of the stands according to how many lockers you need them for. At G-Force we supply plastic lockers with a standard of either a swivel catch lock which can be locked using a padlock, or a key lock; either is very convenient for the users. If you would like a coin return lock installed on your lockers, this is an available choice and is ideal for use in gyms, swimming pools or other public services in which it may be inconvenient for customers to have a key on-hand. Coin return locks are also brilliant for adding more safety to the structure, ensuring the peace of mind of your employees and customers. They are easy to operate and are not likely to break, catch or cause any issues for anyone using them. You can choose for coin return locks to be weather proof in case you would like your lockers to be placed outdoors. The plastic lockers we supply are all made in our own UK factory, ensuring only the best quality and manufactured and moulded to ensure that they are durable and long-lasting. We hold all our items in stock, allowing you to receive your items speedily. We pride ourselves on the knowledge and expert advice all our staff at G-Force can provide for our clients. At G-Force we ensure that all the products we provide our clients with are of the best quality, and we provide our customers with a quality service. You can count on G-Force to be on-hand for any of your queries and offer you the advice you need. Contact G-Force today for your plastic locker needs!